Costa Rica had always been one of those countries that I had dreamed of visiting but never thought I actually would. I loved seeing pictures of the volcanic beaches and sloths hanging in trees, basking in the jungle’s shade. All that dreaming (and working) eventually led me to see the jungles and "playas" (or beaches) of Costa Rica. The landscape of the country itself is breathtaking. When we first arrived in December, everywhere you looked was a different shade of green soaking in the sunlight. Now that it's spring, it has started to dry out a bit—like that Christmas tree you kept for too long and forgot to water. But no matter what season it is when you come to visit, there will never be a dull day. The Arenal Volcano. An active stratovolcano in north-western Costa Rica. Like most working adults, during the week it is all work, but during the weekends it's all play—and, boy, did I play hard. One of the first weekends here I headed to Arenal where there is an active volcano, hot springs, hanging bridges, and a waterfall all within 30 minutes of each other in the town of La Fontana. Talk about diversity! There is also an abundance of activities that surround the volcano. You can go zip lining, kayaking, or go for an ATV tour around the base of the volcano and get a little muddy like I did. La Fontana is full of little local cafes, shops, and restaurants, so there is plenty to keep you busy. Be sure to try some of the Costa Rican coffee as well; it might be the best cup of joe you ever have. The La Fortuna waterfall emerges from dense jungle greenery, and drops some 200 feet into an emerald pool below. When I travel, I always choose to stay in an Airbnb rather than a hotel or resort. The resorts and hotels here are amazing—they are—but when you stay in one of these resorts you don’t have a reason to leave. They have everything you need right there, and I needed to get my feet wet (and sandy). 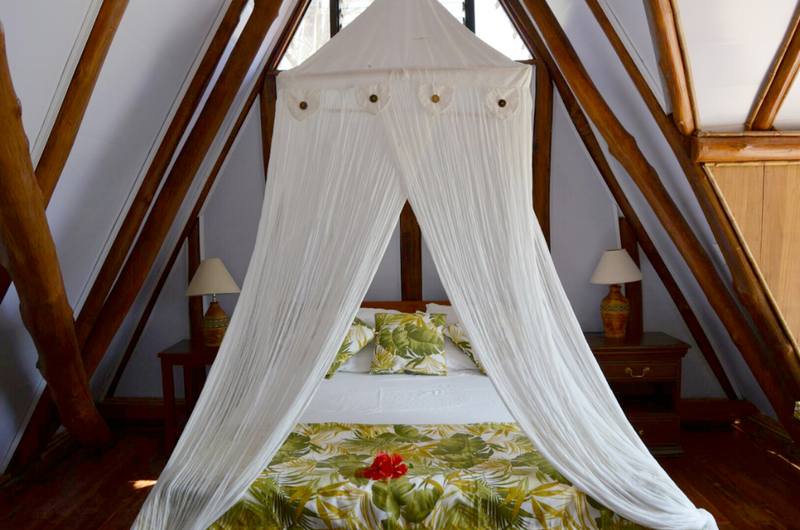 Plus, what a better way to take in the country than sleeping with nothing but a mosquito net around your bed? Don’t worry—I only saw one tarantula. On another weekend, I took a little road trip. 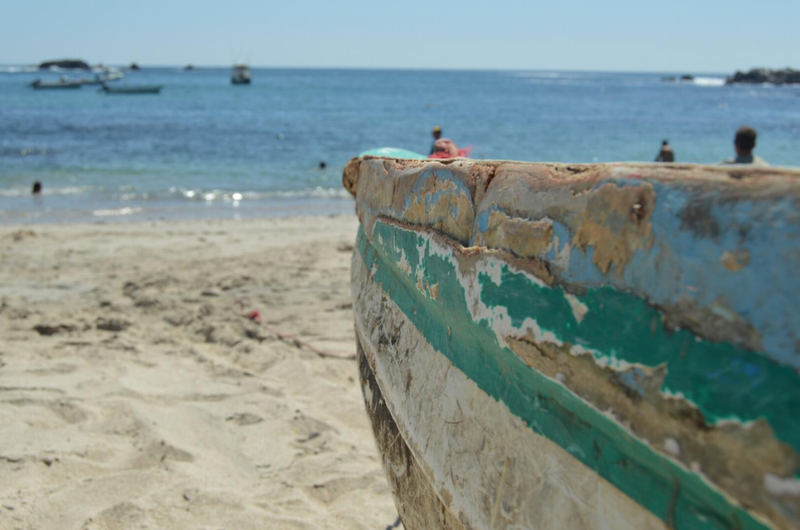 I started in Papagayo and headed south towards the beach town of Nosara and managed a few stops along the way— anywhere that had the word “playa” in it actually. Playa Del Coco was my first stop. It is a lively town filled with some of the best nightlife I had seen yet, with an even better view at one of my favorite restaurants called The Lookout. An apt name, as it sits on the top of a hill overlooking the city and the little cove the Coco locals call home, which is known for their fresh oysters plucked right out of the bay. The view from The Lookout. A seafood restaurant and oyster bar located in Playas Del Coco, Guanacaste, Costa Rica. The next stop was the town of Tamarindo. If you want to catch a wave, then this is town for you—watch out for the crocodiles, though. I haven’t personally stayed in this little Airbnb I picked out, but the idea of “glamping” in a Costa Rican surfer town should go straight to the top of your bucket list. My next stop was Playa Marbella. To be completely honest, the real reason I stopped here was that I saw the words “Tiki Bar” and it seemed like a good place to have a pineapple basil daiquiri. On this beach, I cracked a coconut with a little girl (okay, she cracked it and then let me eat it afterwards), fell asleep on the warm sand, and then proceeded to get rudely woken up by a rogue wave. The wave also stole my coconut, but I won’t hold it against him. My second to last stop before I entered Nosara was probably my favorite, the town of San Juanillo. It was two little coves coming together with a rocky peninsula in between them. The waves were mild, the water was crystal clear, and the scenery was gorgeous. Walk between the two coves and pick which one you like more. Both have their share of big volcanic rocks, white sand, and hermit crabs skittering along the beach. Little fishing boats with their blue paint chipping anchor themselves on one cove while the other remained untouched. My very last stop before reaching my destination was Playa Ostional. This beach is famous for being a nesting beach for sea turtles. Unfortunately, I came at the wrong time of day and didn’t get to see any turtles, but this beach has dark volcanic sand and should come with a warning label for how hot it gets during the day—my feet are still crying! Be sure to head over there yourself and let me know if you see any little Squirts headed into the big blue. Finally, I arrived in the town of Nosara. It is not the local town you might expect. This town is full of people from across the world that fell in love with Costa Rica and settled there. You'll find a bagel shop, a French cafe, along with little hippie and yoga boutiques. One restaurant described the town as “a drinking town, with a yoga problem.” Whether you want to surf, drink, try out yoga, or just suntan, Nosara is for you. I stayed in a little cabana about 20 minutes from Nosara, and it was the perfect distance to feel like you are hidden away in the jungle, but still close enough to go out to eat. Speaking of food, La Luna was by far my restaurant in Nosara. With a bottle of wine, a beach view, and amazing food this is an absolute must. Head over for the sunset but be sure to stay later so you can take a walk along the beach at night and star gaze. You might even see luminescent plankton illuminating the waves. Costa Rica has an energy like I have never seen before. The “pura vida,” or pure life, lifestyle just radiates throughout the country. Everyone is friendly and willing to help just because I was a guest in their country. Even when my underdeveloped Spanish speaking skills failed me, a smile is sometimes all that needs to be said. Pura Vida, my friends. All photos by the author, follow along with her travels here.